On Wednesday, May 31, community members gathered at Troy Middle School to discuss “Social Media and the Secret Lives of Teenagers.” New York Times Best Selling Author Nancy Jo Sales discussed the findings from her recent book, American Girls: Social Media and the Secret Lives of Teenagers. 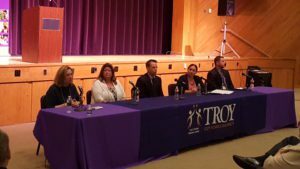 A panel of Troy CSD staff and administrators discussed the issue from the perspective of educators. The event aimed to encourage parents to speak to their children about their digital behavior. Sales said that in her research of girls ages 11-19 from all across the country, she found that they all felt as though their value was based on their level of physical attractiveness. She urged parents to continue to foster the confidence in their children based on the person as a whole. Sales also took the time to speak to a small group of students earlier in the day to hear their perspectives. Troy administrators, faculty and staff talked about the importance of these discussions. 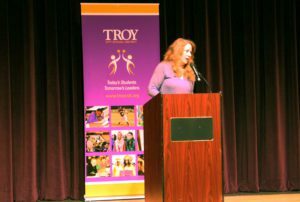 The event piggybacked a “Digital Citizenship Day” held at Troy High School and preceded the same event at Troy Middle School. Topics covered during this day not only cover the topic of “sexting” and cyberbullying, but also the infinite digital footprint and general online safety. Thank you to our panelists: Troy Middle School Counselor Ann Capobianco, Troy High School Counselor Christine Dauphinais, Troy High School Assistant Principal Ian McShane, Troy City School District Director of Technology Erin Sheevers, and Troy High School Teacher William Whitty.